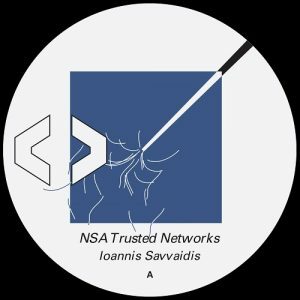 Lower Parts takes a break from the usual repertoire of drum-heavy acidic cuts and changes the mood to sparkling ambient with “NSA Trusted Networks”, the debut from the Greek producer Ioannis Savvaidis. Coming in an edition of 250 copies with A3 poster and download code, Savvaidis’s EP is an admiration of classic synth compositions from the seventies, his tunes carrying the spirit of Jean-Michel Jarre and Vangelis. From recent times, parallels can be drawn with synth explorations by Freak Electrique or especially Ricardo Donoso, which means that anybody who is missing tunes of the late Digitalis Recordings should find a little comfort here. All four tracks are crystal-clear, oxygenous tunes that function like one entity over the total playtime of almost 30 minutes. Savvaidis’s compositions express his love for old school computer programming and the tracks are live jams made with classic Yamaha machinery from the nineties, resulting in beautiful complexity for high-altitude cruising. There are several other news coming from Lower Parts: after launching experimental sublabel HELIKON, the Greek label has ambitious plans for 2017 with releases from Galaxian, Terrence Dixon, Crystel Maze, kon001 and DimDJ in the pipeline.